Google recently gave Google Now the ability to open the camera app or play some music, but that’s only scratching the surface in terms of what the virtual assistant could do in terms of controlling the hardware of your phone. While Google seems to be dragging its feet in giving Now more control over your phone, developer Ryan Senanayake (RSen), of OpenMic+ fame, found a way to bring hardware features support to Google Now via his new app Commandr. To issue one of these commands, you need to say “Ok, Google note to self <command>”. Admittedly, uttering “note to self <<turn off Bluetooth>>” isn’t exactly an elegant solution, but, in some use cases the feature could be really useful. There are some limitations – GPS toggling doesn’t work on a Nexus 5, for instance, and turning off the internet connection will prevent you from turning back it on with Commandr, because Google Now requires a connection to work. But there is potential here – the developer is planning to add new commands (on which you can vote), and, even better, you can integrate Commandr with Tasker, which makes it possible to achieve all sorts off cool features, from changing your device profile for a meeting to turning off the lights at home. 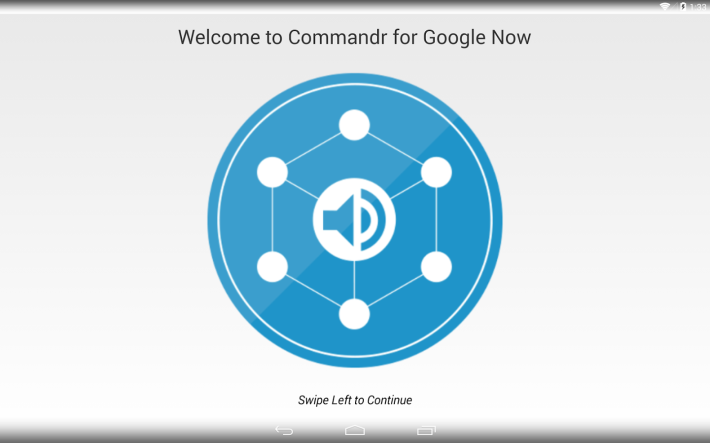 Google will probably – eventually – add similar functionality to Now, and Commandr is not the first app that offers hardware control via voice commands (Utter comes to mind). But if you are regular Google Now user and you don’t mind the “note to self” issue, Commandr can, indeed, make voice commands better and more personal for you. Commandr is available for free in the Play Store for devices running Android 4.1 and higher, no root required.